Des Moines, IA -- The Iowa Barnstormers today announced that a fourth home game from the upcoming 2010 season will be nationally televised as the NFL Network will now broadcast the team's April 24 home game against Oklahoma City. Barnstormers General Manager John Pettit said the April 24 game will remain on a Saturday evening, but the kick-off time will be moved back an hour to 8:05 p.m. CST to accommodate the national television schedule. "We are excited to about the opportunity to showcase Barnstormers football, our loyal fans, and Iowa to a national audience four times this season," said Pettit, noting that the Barnstormers other home games televised on the NFL Network include April 2 (Chicago), May 21 (Arizona), and July 16 (Spokane). Kick-off of those three Friday games will be 7:05 p.m CST. 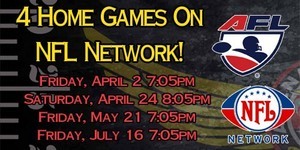 The Barnstormers April 30 road contest at Orlando will also be broadcast live on the NFL Network. Pettit said single tickets to all eight home games are now on sale and can be reserved by calling (515) 633-2255 or visiting www.theiowabarnstormers.com.